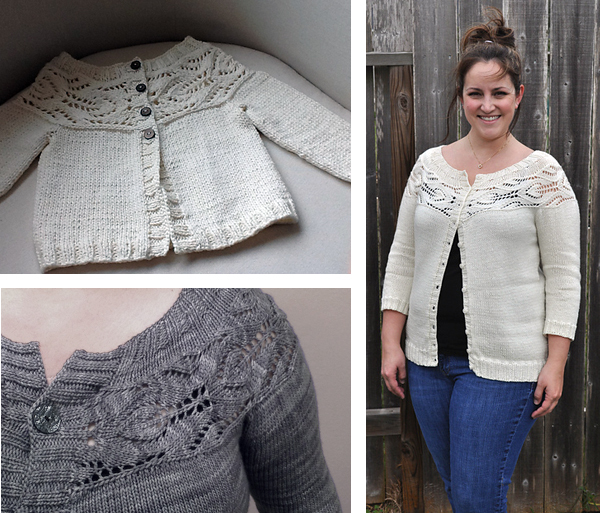 Many of our friends, fans, and fellow knitters are excited about the Lush cardigan… So we are offering it as an early-release pattern to keep you busy while you await the official release of Handmade in the UK, our new lace book. The Deal: Get Lush now, and when the book is launched we will send you a coupon for $6 off the price of the complete collection! Lush is a special design with some unique features, so I want to let you know a bit more about the details of sizing, yarn, and construction and offer a few useful tips on how to achieve the perfect spring cardigan! Like the best of Tin Can Knits’ patterns, Lush includes an impressive 16 sizes: 0-6 months to ladies 4XL. I think it is absolutely adorable on Alexa’s daughter Hunter, and love how it looks on me too! Complete sizing and yardage info is available here. Everyone has a personal preference when it comes to sweater sizing, and I understand not everyone wears their sweaters as tight as I do! I am a 39″ bust, and I am wearing the size M (36″), which is 3″ negative ease. For a form-grazing but not so tight look, I suggest working a size that is 1.5-2 inches smaller than your actual bust measurement. For more info on how our patterns are sized, and how to adjust for a perfect fit, see this tutorial. 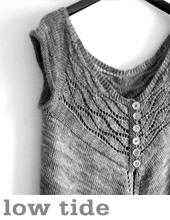 This design is knit yoke first (then body and arms) so you can try it on as you go to check sizing. It is easy to adjust the total stitch count at the bust or upper arms (just increase or decreasing a few stitches) if it seems like the garment will be a bit too big or too small. You may choose to work waist shaping so the sweater hugs your curves, or simply knit straight to the hem; the pattern includes instructions for both options! Baby & Adult versions of the Lush Cardigan made by test-knitters: carolbuz, vaninea, and dbbstitch. See more here. The gauge for this design is 20 sts / 4″. For the ladies sample, I used Skein Queen Voluptuous in ‘persimmon’ [more about Skein Queen Yarns here]. 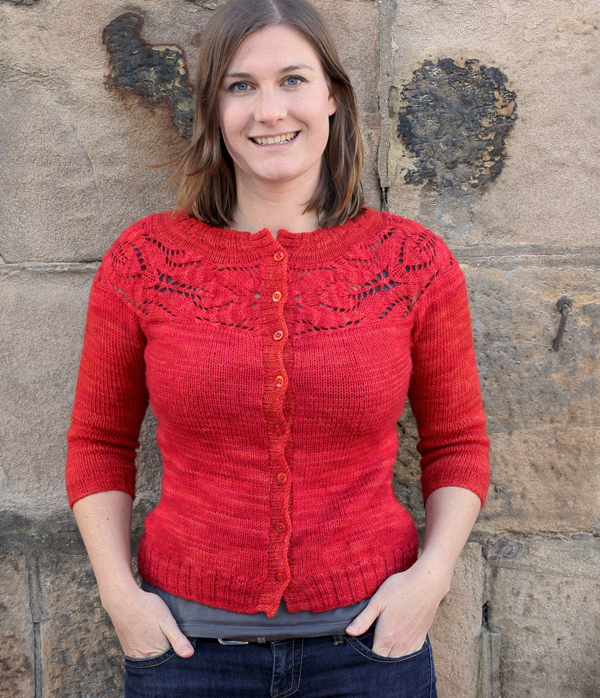 Voluptuous is a fairly heavy DK weight, which knits quite naturally at 20 sts / 4″. Alexa knit the 2-4 year old size using Sweet Georgia Superwash DK in ‘silver’. You may choose to work in a DK weight or a lighter worsted weight (for example Cascade 220 would work well), as the pattern is quite flexible. 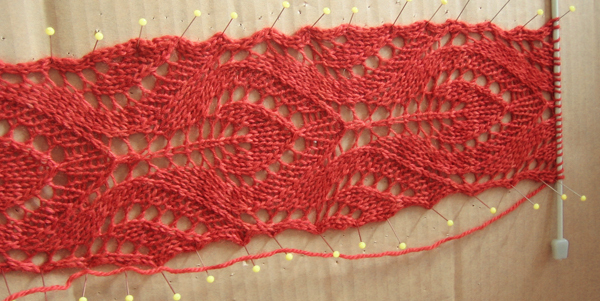 For the lace panel to really ‘shine’ and hold its shape well, I recommend using a wool or wool blend yarn. Yardage requirements and suggested needle sizes are listed here. Lush has a unique construction, but it is not too complicated – and it’s fun! First you knit the lace yoke band. You start with a provisional cast-on – I suggest using the crochet chain provisional cast-on [see the tutorial here]. After completing the right-hand side of the band you unpick the provisional cast-on, place stitches back on needles, and work the left-hand side of the band in the same manner. Do not slip the first stitch of the row, as you will need the right number of rows to pick up in. Wet block the completed band; if you have blocking wires I suggest you use them to even out the edges of the lace band. As you see, I didn’t have mine nearby… and so a lot of pins were required! After blocking the lace yoke band, you will pick up stitches and work up to the collar. Ladies sizes have a fairly wide neck with some short-rows to shape the back of neck. 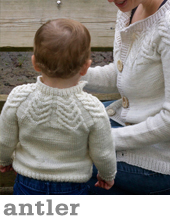 Child sizes are similar, but omit short-row shaping at back of neck. If you prefer a higher neckline, work a few more stockinette stitch rows before the ribbing, or a few more short-rows. Once you have completed the collar, pick up along the bottom edge of the lace band and work down the yoke to the point where body and sleeves separate. Then work the body in rows, and the arms in the round to cuffs. Ladies sizes XS – 4XL include optional waist shaping instructions. FINAL ADJUSTMENTS ::: spend a bit of time looking at yourself in the mirror! Before working the button bands you should confirm that you are happy with the fit. You may want to block the cardigan at this point. If you decide you would like to make the neckline higher you can work more rows of ribbing, or incorporate a few more short-rows to raise the back of the neck. For a tighter neckline, you can decrease further and work the ribbing on a smaller number of stitches, or simply try a smaller needle size or tighter bind-off method. This is purely a personal choice, and you may need to experiment to find out what works best for you! Lastly, work the button bands by picking up stitches along the edges of the cardigan opening [tutorial here]. I suggest working the non-buttonhole side first so you can plan how many buttons you want to have, what size they should be, and what the spacing should be before working the buttonhole side. Finishing up, you will want to spend some time searching for the perfect button! I absolutely LOVE the little yellow buttons that Alexa put on Hunter’s cardigan! 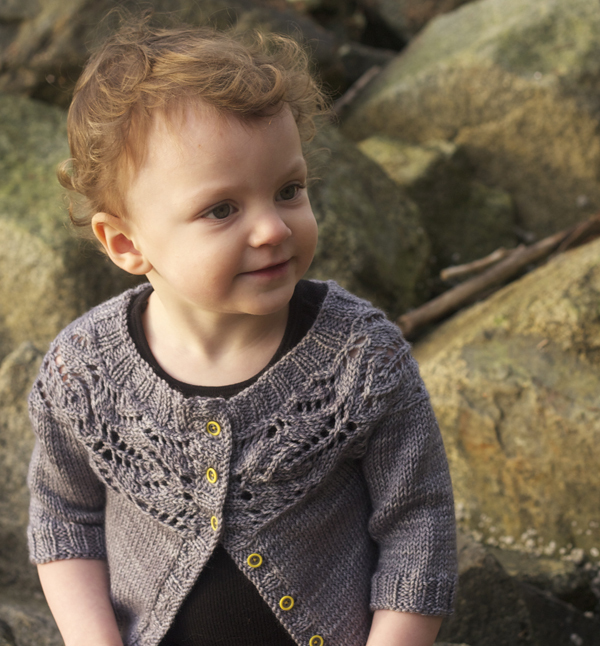 If you are thinking about knitting the Lush cardigan for yourself, or a little cutie you know, you should join us on the Tin Can Knits Ravelry group for a Lush KAL. It will be fun, you will probably to learn something (or teach us something new), and there will be prizes! We hope to see you there. Want to know when the Handmade in the UK ebook & print book are available for purchase? Sign up for our email updates, and we’ll send you a note when it is ready! ← What’s in a Button? I love knitting this :) i’ve been using the gramps sweater turorial for help and it works out great. I learned tons of techniques too. Can these front button sweaters be worn with the buttons in the back? So funny you should ask, Hunter just started wearing her Lush cardigan backwards and got SO many compliments! Because the neckline is a bit wider on this one no additional shaping is needed. I’m knitting Lush and I have trouble picking up stitches from the lace panel. My edges have never been neat and as I can’t drop a stitch this time to make them knit, it looks all wonky… any tips? Can I maybe add a stitch at each side and then pick up one stitch in, like you suggest for doing the ribbed buttonhole edge? Hello Emily. I went ahead and started Lush without reading your comments on fitting this sweater. I have a yoke that I can see is way too large. I did join the segments from the provisional cast on so was thinking of just removing one whole repeat of chart B . I wonder if I can unravel knitting from the end on the stitch holder. I will let you know. Beautiful pattern. I won’t mind doing the yoke again if I need to. I have never created anything in DK weight yarn. At my local yarn store, they do not have the brand you mentioned, so I am venturing to find another DK weight yarn. They had some \DK brands that were smooth feeling while other brands have a rougher texture. For lace work, what would you suggest? Hmm, good question, at the risk of being completely unhelpful, it really just depends on what you prefer. The original Lush was knit in a slightly smmoother yarn, but a more rustic yarn would also look beautiful. I’m struggling with size. My wee grand daughter while 1 yr old only has a 17″ chest and 7″ arm length…she is very small for her age. With the ease in the pattern would you reco the 6-12 month size or the 0-6 month size. I have the lace complete for the 6-12 month size but could frog it back. Thoughts? Thank you for your timely response. You are the best!! 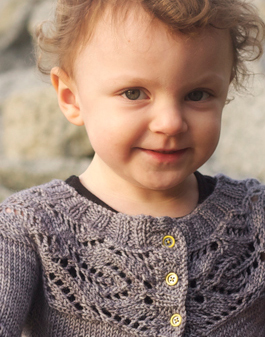 I am doing this sweater on the 6-12 month size. When doing the yoke band it says to do 78 rows following the chart. Do you count the purl rows in this 78 or not. Ie is it 78 rows or 156 rows. Thanks for your help! 1. do I knit the 46 stitches on each side (size xs) before I put them on hold for the arms? 2. where do the second 8 CO stitches for the underarm stitches go, before or after the stitches for the right sleeve? 3. for the body, do I just knit forward and backwards all the stitches for L front, back and R front or do I knit the three parts separately? 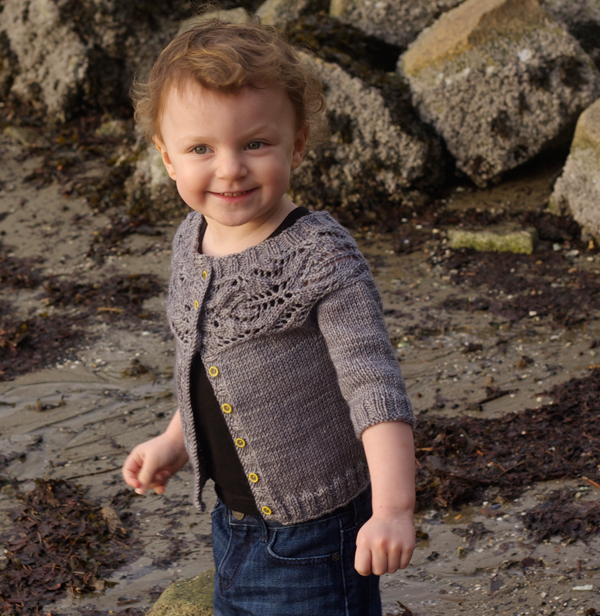 I just found your excellent tutorial for the Gramps Baby Cardigan where you answered all my questions (and I learnt how to do the backward loop cast on. This is such a wonderful help for people like me who are doing stuff for the first time – thanks a lot! 1. When you place the stitches on hold, you don’t knit them first, you just thread a bit of scrap yarn through those stitches, as you take them off the needle. Then tie the ends of the scrap yarn so you don’t loose the stitches. Then you’ll cast on the underarm stitches (I’d suggest you use the backward loop cast-on method for this). Then you’ll knit across the back stitches. Then at the right sleeve you’ll put the stitches on hold in the same way as at the left (without knitting them first), and then cast on stitches for the right underarm in the same way as you did for the left. Finally you knit the remaining stitches (right front). 3. To continue on the body, you knit all the stitches that are now on the needles back and forth in rows. So you’re effectively knitting the fronts and the back portions all at the same time. Hope this helps! Just try it and you’ll see how it works! 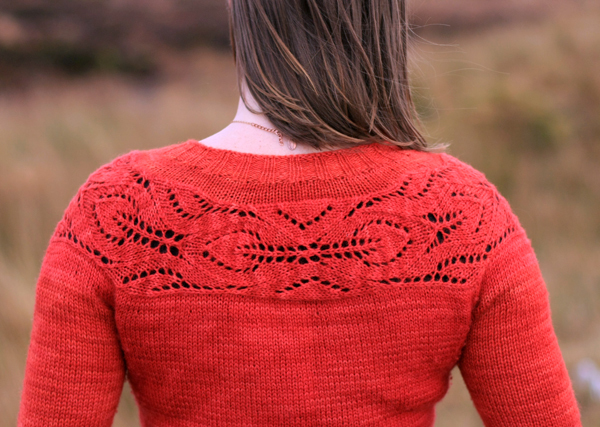 Also see our Flax Pullover tutorial – it shows how to work a top-down garment step-by step. Hi Emily, I recently bought your lovely book and I’m getting the feeling that this (very cute) pattern wasn’t written with not-so-well-endowed ladies in my mind. So if my bust measurement is 31″ (A cup) and I want the same amount of ease as the picture (I like a “shrunken” fit to wear with dresses)… I basically have to knit the size 10 y/o and add my own waist shaping? But won’t the shoulders end up way too narrow? (I’m not very tall, but still about 25 cm taller than an average 10 year old…) What would you suggest? What a gorgeous sweater! Do you have any advice for converting it to a pullover? It looks like it’s knit on a circular needle, so I don’t imagine that would be so difficult, but I’m interested in how you would recommend doing the lace yoke in one piece. Im not sure if its me, but I cant seem to find any suggested measurements lengthwise for blocking the yoke band. Ive browsed both here and on ravelry. Im knitting the 2-4 size, and only find the width of the band whwn finished, but not the length. Im afraid Ill block it too aggressively! Any pointers would be most welcome -I just love this pattern! So easy to follow. Hi Maya – there aren’t any suggested lengthwise measurements, because it doesn’t really matter. Don’t worry about blocking too aggressively. When you pick up stitches each side of the band, then work stockinette up and down, then gauge of that stockinette stitch portion will control the length, and it will all work out! Many people were concerned about this, but it works out fine in the end! Also, you will re-block the completed sweater after knitting it, so it all evens out at that point. Je voudrais bien acheter vos grilles mais sont elles traduites en francais ??? je me suis abonnée à votre blog mise à jour … je verrais bien si j’arrive à tricoter avec vos explications si elles sont en anglais ! Bonjour! Je ne parle pas français… But thanks for the lovely compliments! We do not plan to translate our patterns, because we wouldn’t be able to provide adequate pattern support in other languages. But thank you for asking, and perhaps the pattern language will be simple enough for you to understand in English. Beautiful sweater! I love the way it is constructed too.